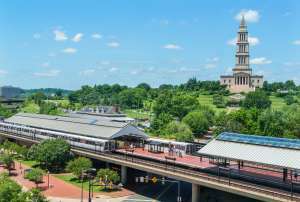 Named one of America&apos;s Top ArtPlaces, Alexandria is nationally recognized as a community with a "backbone of creative culture...exceptionally successful at combining art, artists and venues for creativity and expression...to make vibrant neighborhoods." The city&apos;s visual arts hub is the world-famous Torpedo Factory Art Center, a former munitions factory transformed into an artistic powerhouse with three floors of artist studios and galleries, plus the headquarters of the Art League School which serves 7,000 students annually. The Legendary Music Hall the Birchmere hosts the biggest names in country, folk and rock, while MetroStage performs top-quality productions in an intimate setting. From musical theater to cozy jazz clubs, printmaking classes to comedy nights, Alexandria&apos;s art scene buzzes with life, forming the core of our city.